Want a safe, adjustable flexible iPad stand holder? 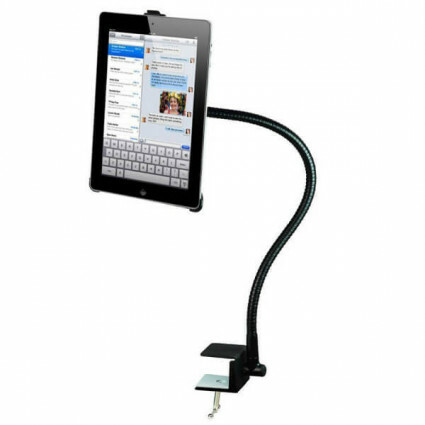 BESTEK gooseneck iPad holder bracket will be your first choice due to its amazing features. BESTEK iPad mount stand securely fits to iPad Mini 3/Mini 2/Mini, iPad Air / Air 2, iPad Pro 9.7". Two-way mounting clamp suitable for horizontal and vertical board, meets more viewing angles needs. Two Holders: one for iPad Mini/Mini 2/Mini 3; one for iPad Air/Air 2, iPad Pro 9.7". Compatibility: iPad Mini 3/Mini 2/Mini, iPad Air / Air 2, iPad Pro 9.7"
No FAQ For This Product Currently.